Seventh Street Books, 9781633883635, 304pp. In early-1900s Los Angeles-- an era of courting, ragtime, suffragettes, and widespread corruption-- a socialite turned police matron tracks down the murderer of a white woman in Chinatown, while trying to prevent the outbreak of a bloody tong war. Los Angeles, 1908. In Chinatown, the most dangerous beat in Los Angeles, police matron Anna Blanc and her former sweetheart, Detective Joe Singer, discover the body of a white missionary woman, stuffed in a trunk in the apartment of her Chinese lover. If news about the murder gets out, there will be a violent backlash against the Chinese. Joe and Anna work to solve the crime quietly and keep the death a secret, reluctantly helped by the good-looking Mr. Jones, a prominent local leader. Meanwhile, the kidnapping of two slave girls fuels existing tensions, leaving Chinatown poised on the verge of a bloody tong war. Joe orders Anna to stay away, but Anna is determined to solve the crime before news of the murder is leaked and Chinatown explodes. 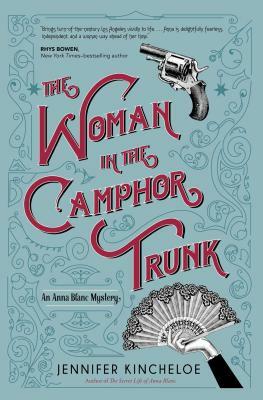 Jennifer Kincheloe is the author of The Secret Life of Anna Blanc and The Woman in the Camphor Trunk. The Secret Life of Anna Blanc is the winner of the Colorado Gold Award for mystery and the Mystery and Mayhem Award for historical mystery. The novel was also a finalist for the Macavity Sue Feder Historical Mystery award, Left Coast Crime "Lefty" Award, and Colorado Authors' League Award for genre fiction. Formerly, Dr. Kincheloe was the principal of a health consulting firm and a member of the research faculty for the UCLA Center for Health Policy Research. She currently does research on the jails in Denver, Colorado.